It has been nearly a year since the Kumamoto Earthquakes. During the earthquakes, the town of Mashiki and the village of Nishihara experienced two magnitude 7 earthquakes, and in the village of Minamiaso, the Aso-bridge collapsed due to a large-scale landslide. As of November 30th of last year, 4,165 additional earthquakes, which could be felt, had been recorded. The number of casualties, including 150 earthquake-related deaths, rose to 205 (Kumamoto Prefecture Crisis Management Disaster Prevention Division Announcement, March 3rd, report). Moreover, at its peak there were over 180,000 evacuees and 855 evacuation centers. 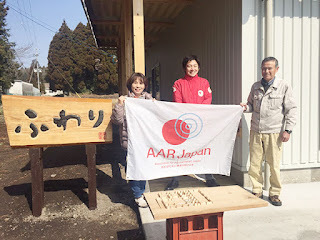 Since the disaster, AAR Japan has been distributing meals and basic necessities and up to now has been providing aid to a social welfare facilities for people with disabilities and to those in temporary residences. During this earthquake, there were supply and staff shortages at the evacuation centers that were established to accommodate those who require special care, such as those with disabilities and the elderly. In addition, temporary residences had not been designed to be wheelchair accessible. It made us recognize again how easy it is for people with disabilities and the elderly to be put into difficult situations in times of disaster. Because of this, AAR Japan has focused on providing aid to people with disabilities, by supporting local organizations which work with people with disabilities and who are leading recovery efforts in the region. In Nishihara Village, 60% of the houses were completely or partially destroyed. 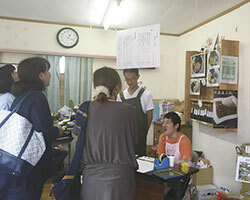 Nishihara Tanpopo (Dandelion) House, a NPO near the village office, is the only social welfare facilities of its kind where people with disabilities go to process crops and prepare and sell bentos (lunch box) and snacks. During the day, it is a cafeteria filled with locals, and is a place where those facing economic hardships can enjoy a meal with others whilst lending a hand to the center. It has become a central entity, a vital place in the village. 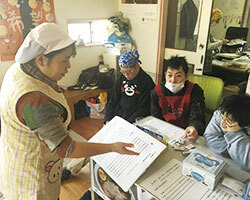 Even after the earthquake, the house has become an evacuation center for those disabled persons and staff who frequented, in addition to acting as a point from which supplies and meals could be distributed to nearby regions. At the same time, however, the pillars and walls of Tanpopo House were damaged; but more than that, the slope at the rear of the building had collapsed. This resulted in the house being designated as “Partially Destroyed” (Habitable with repairs). It was in such a dangerous state, that the building shook every time a car drove past. For the sake of those who had nowhere else to go, they continued their activities at the damaged facility, but the village, who had the rights to the property, estimated that it would take two years to complete the repairs. There was a need to secure a safe place as quickly as possible, and with the completion of large scale temporary residences in the neighborhood, it was anticipated that there would be a greater demand for bentos and cafeteria services. They had hoped to reconstruct an enhanced facility that could accept a greater number of people, more so than prior to the events of the earthquake. 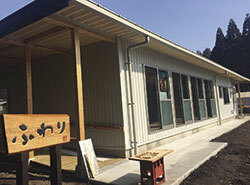 Seeing their needs, AAR Japan decided to support the construction of a new facility for Tanpopo House. In working to build the facility, we took into consideration the interests of the visitors and workers of the facility as well as surveys noting the situation in the region. We conducted many meetings, keeping in mind what kind of facility there was a need for. Additionally, we aimed to have a facility that frequent visitors and others could evacuate to, as in the case of when the earthquakes struck. On February 28th of this year, the construction of the building was completed and the new facility was given the name “Fuwari”. “When the disaster struck, I really couldn’t see our future, and really worried about what to do,” said Director Kazuyuki Fukunaga, as he stood in front of the new building. “But with the support of AAR and many others, we have been able to come back.” he said with a smile. “I can never know when I’ll be on the receiving end of others’ support; this earthquake is a good example. We’ll continue to strive to help not only those with disabilities, but others such as the elderly, children, and the poor.” The Facility Supervisor Kayoko Uemura said, “The year has flown by, but now this facility is complete, and there is so much we can do. We’ll need to work ever harder” she said, expressing her ambition. They are planning for ten people to start work in the new facility in April, but have already begun activities to bring in those with disabilities from the area and to establish a foothold in the community. In the Sawazuno District of the Minamiaso village, the Aso-bridge, which was connected to the Tokai University campus in the neighboring Kurokawa District, collapsed. Major roads were damaged and infrastructure such as water sources, pipes, and agricultural waterways, sustained significant damage. There had been 44 households in the district, but approximately 80% of them were affected and were forced to move into temporary housing. Many are still commuting to their old homes from the temporary houses to do farm work. However, up until December of last year, those houses in the affected areas were unable to use tap water.. Because of this, residents were using drinking water instead, which was only occasionally being delivered to the community center along with other relief supplies. The fact that they were unable to obtain enough water for day-to-day life was a large economic burden.Everyday they had to deal with the stress of not knowing when the water would eventually run out. Faced with this situation Sawazuno District Head Noriaki NOGUCHI Listened to the needs of residents and coordinated with them. Thanks to his extensive co-operation, AAR Japan provided drinking water to 35 households (approximately 100 people) in need of aid. At present, the temporary construction of water pipes has been completed, and residents are able to get drinking water into their homes, but real restoration construction will continue for a few months. The reconstruction of damaged roads has been slow, and there are many districts where it is unclear when everything will be restored. Full restoration of the Aso-bridge, which one could assay is a lifeline to the region, is expected to continue past the summer. This is seen as a major problem in Minamiaso, where tourism is a major industry. AAR will continue to keep our eyes on the situation on the ground and provide as much as support as possible as the need arises. Immediately following the earthquake, we have adjusted to the circumstances on the ground and provided aid, but thanks to those who have continued to support us and answer our call for donations, we were able to not just stop at restoration work, but also provide aid which will help the community overcome vulnerabilities that became apparent during the disaster. *This aid has been supported by the generous donations made to AAR Japan and grants from the Japan Society.